A new and exciting enhancement now available in the Extranet Portal: you now have the ability to manage your digital paid content on TravelKS.com yourself! 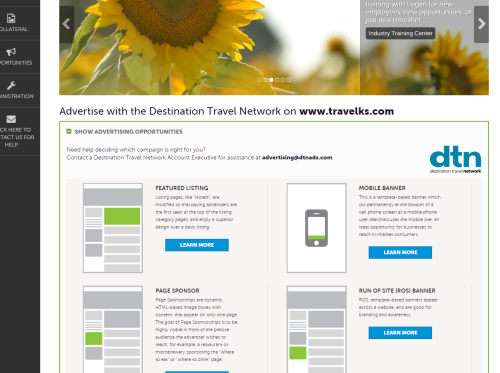 In partnership with Destination Travel Network (DTN), the leader in travel/tourism paid content publishing, we have launched DTN Express, —a quick-purchase platform enabling you to explore and purchase select placements that enhance the visibility of your business on TravelKS.com and deliver your ad message to visitors who are actively planning their trip to Kansas and have a high intent to buy! Starting a new digital ad program (or renewing a current program) is as easy as following the prompts and selecting your placements. The DTN Support Team will reach out to assist you with the final details before launching your digital program. For Extranet login details, contact Logan. For help with DTN Express contact the DTN Support team at support@dtnads.com. And as a reminder, you can use your Extranet login to access the DTN Portal for a comprehensive report of your digital program’s performance.